Best Buds is a locally owned floral company in Edmonton, Alberta. They came to us with a desire to grow their business online while creating an entirely new look and feel for the company. Together, we created a brand that would help Best Buds to become one of the top florists in Edmonton. Best Bud’s flowers are rich, colourful and beautiful. We had to create a website and brand that reflected this, while creating a brand that would be timeless and grow as the company did. 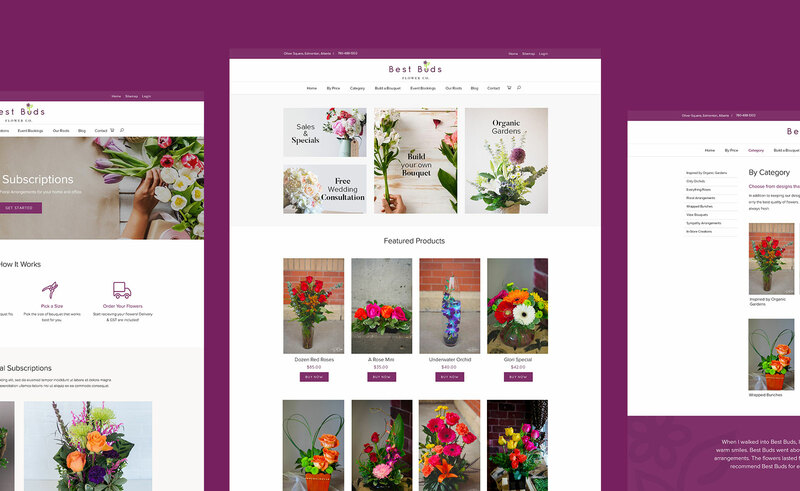 Bold colours and simple graphics, along with professional photography, combine to create a website that is truly authentic in the floral business. "Overall, we at Best Buds are more than satisfied with the excellent service Mediashaker provides us and we would highly recommend them to others as they add a personal touch type of experience which we very much appreciate within our small local business." In addition to the website and logo, we created a number of assets to be used for Best Bud’s digital marketing and print marketing efforts. This included everything from flower care cards, business cards, stickers, a tire car cover, sandwich boards, email signatures, and a floral presentation to show brides. We also helped them create a hiring video that showcased the working atmosphere at Best Buds. Our goal was to create a smooth and simple online ordering experience for Best Buds’ customers. We wanted to ensure that their products were easily accessible on the homepage and that configuring the flowers (delivery time, bouquet size) was straightforward. We also made sure that it was easy for Best Buds to update the homepage on a regular basis based on seasons and holidays. One thing that makes Best Buds a unique client is that they use the back end of their website as their POS in-store. Using our software, ShoutCMS, they are able to create invoices when customers purchase flowers. For this reason, we call Kim, the owner of Best Buds, the “ShoutCMS Queen”!